Land Rover is showing off the agility and resiliency of the 2018 Range Rover Sport in a three-part Motor Trend native ad series. Motor Trend Presents: Driven shows the vehicle on four types of terrains across three locations with British race car driver Justin Bell behind the wheel. The multichannel effort includes linear, digital, social, CRM, print, and OTT/AVOD (over-the-top free and ad-supported video-on-demand services). In the series, Bell and the 2018 Range Rover Sport race against hill climb cyclist Phil Gaimon on a steep, windy road in the French Alps. 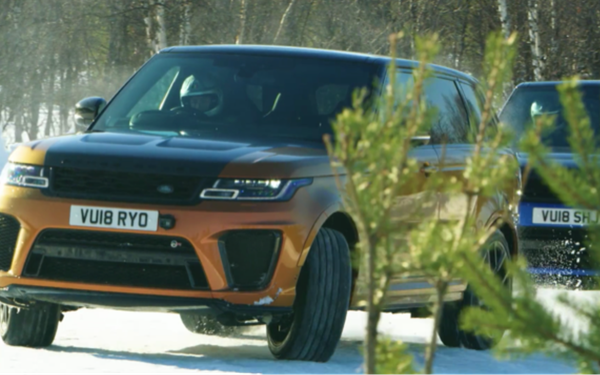 Next, the series moves to icy Ivalo, Finland where Bell races Belgian racing driver Vanina Ickx at the Arctic Circle Test Track, both drivers wheeling the Ranger Rover SVR. Finally, Bell takes on famed race car driver Dario Franchetti in Monterey, California in a two-part race. The goal of the series is to reaffirm the status of the Range Rover Sport as the most dynamic Range Rover, says Taylor Hoel, manager, media strategy and planning, Jaguar Land Rover North America. “We know that Range Rover Sport customers are by nature extremely driven individuals, and the series was designed to tap into this through friendly competition,” Hoel tells Marketing Daily. Motor Trend Group is conducting an ad effectiveness study as part of the program in order to provide Land Rover with results at the campaign’s end. Not only does Motor Trend serve an audience of automotive super-consumers who frequently purchase vehicles and index very highly in Land Rover ownership, but those consumers are also very influential, Hoel says. This series embodies the desire to feel alive by going out into the world and challenging it, Hoel says. “With a Range Rover Sport, you can push further and faster into unseen spaces and reveal more of what life has to offer,” he says.